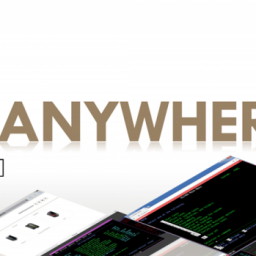 A lot has been going on lately in Cybele Software, and the big news is, without a doubt, the reworking of one of our flagship products, our Terminal Emulator for browser: z/Scope Anywhere. Integrated printer emulation: TN3287 and TN3812 printing terminals support implemented. Send print jobs to your browser-side printer, or download them to a file. Easier access to printing job files: printing queues, print preview, and more. Direct access to the emulation screen through a dedicated virtual path per connection. Facilitate integration by allowing the user to bypass the landing page. Discardable connection URLs: by using One Time URL (OTURL) you can create a temporary, unique URL to provide single time access to a specific connection. This URL expires as soon as it’s used or after a specific period of time. Secured access comes in many flavours: z/Scope Anywhere now provides multiple authentication options, including a simplified Single Sing-On. Enable access for end-users via one or more of these authentication methods: Logon, OAuth/2 (Google, Facebook, etc), RADIUS or customize the authentication process using a new provided security API. Updated and flexible authentication scheme. Provide anonymous access to connections, avoiding the login process. Combine authenticated and anonymous access connections for logged in users. New and enhanced user interface. New navigation and connection views. Classic, Coverflow, Gallery and Grid modes available. Open new connections on different tabs or manage them within the z/Scope environment. Create Display, Printer or Display and Printer connections. This is only the big picture of what the new z/Scope Anywhere brings. 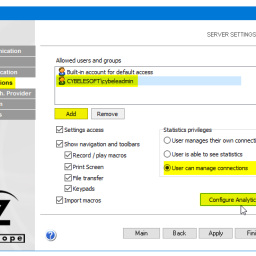 We’ve launched the first Beta version of z/Scope Anywhere 8 today and you can download it here. This new version of our existing HTML5 terminal emulator is more powerful and versatile than ever, and in a few days we will be telling you more about it. 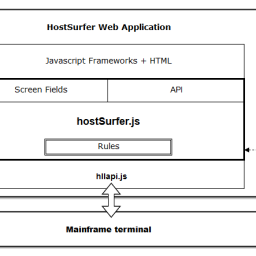 We have recently updated z/Scope Anywhere to add two powerful programming extensions: HLLAPI.js and HostSurfer.js. Thinfinity VirtualUI meets HTML5 Web Components! New here? Read more about why software developers are adopting Thinfinity VirtualUI to increase the value of their Windows applications…. Contact our tech support at support@cybelesoft.com.